Lately, every Monday night, my husband and I find ourselves watching Food Network’s Diners, Drive-Ins and Dives with host Guy Fieri. The show usually ends with me salivating over every greasy spoon and pit bbq this show puts on television. I also swear we are going to visit every place we have ever seen featured all over small town America. Everything always looks amazingly delicious. So when we found ourselves in Portland for a couple of days this past week, we decided the diners, drive-ins and dives were where we wanted to feast. Wow, did we feast. I know I was doing the play by play on Facebook this past week with many of you following along so I thought I would wrap it up here with a little more detail. There are eight diners, drive-ins and dives (that I could find) having been featured on the show from Portland, Oregon. In two days we only visited three. After eating at these places you really didn’t need another meal for hours and hours, there was no way we could have seen them all in forty-eight hours time. Let me just say, the three we went to were incredible. I have never been so stuffed and filled with food satisfaction in all my life and I can eat a lot. I wish I had better pictures of everything we chowed down on but these places are tiny and often dark, not conducive to getting great photos. Plus in such small quarters the last thing I wanted to do was have my camera flash annoying other patrons often sitting no more than two feet away. I did my best but wow did we enjoy the food and the atmosphere of these places. I don’t think these are restaurants we would have ever stopped at or given a second thought to try. We can’t wait to try the other five on the list on a return trip and even go back to the places we already visited, all had incredible tasting food. We arrived at our hotel about 4:30 PM on a Tuesday night, by 5 PM we were headed out the door to Podnah’s Pit BBQ, about 4 miles from where we were staying and in the middle of a fairly residential area. We thought for sure our GPS was taking us off in the wrong direction. It was very dark and pouring down rain but we found it. When we arrived about 5:15 PM the place was fairly empty however, within 15 minutes it was packed and no available tables were to be found. There was now a line out the door. Pretty good for a Tuesday evening. 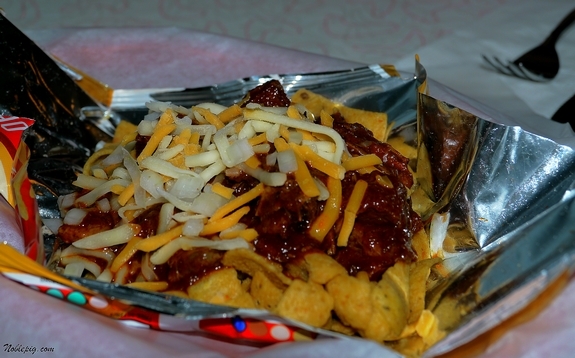 We started our meal with these Frito Chili Pies served right in the wrapper of the Frito’s bag. Very simple but a great way to get a taste of their Texas Red Chili. So, so good and not too spicy for the kids. We also had Iceberg Wedges with Homemade Blue Cheese dressing. Fabulous!! The hubby had some great Hefeweizen style beer on tap and I had French red wine which was very good. 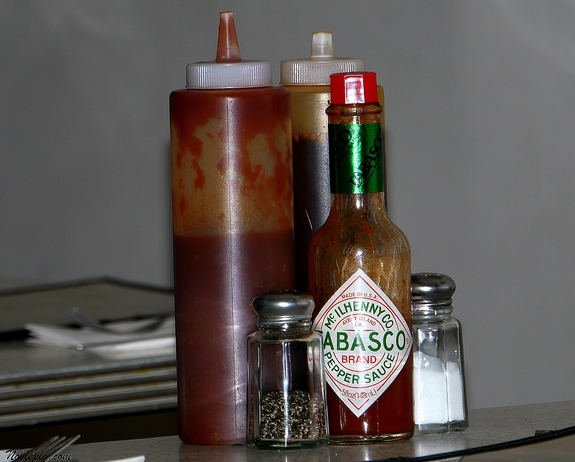 What every good BBQ place has on the tables, their sauce in squeeze bottles. All I can say is I asked if they were bottling it, I would have bought a case. I asked what the underlying secret was to the recipe and I was told they use brewed, local coffee as one of the ingredients. We sauced everything we ate, it was insanely good. 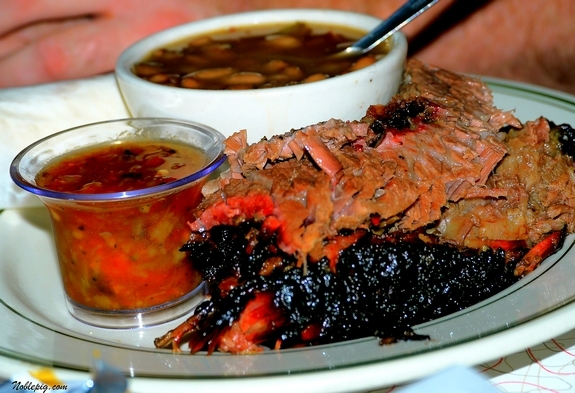 The hubby ordered the Plato Tejano, a large plate of sliced brisket, pinto beans, tortillas and salsa. The meat was of course as tender and tasty as you can imagine. My son and I had pulled pork. We shared sides of cornbread, potato salad, coleslaw and collard greens. When I looked around to see what other diners were eating many had these baskets of Pork Spareribs which were huge! They looked incredible and something we want to try next time. Of course my youngest and pickiest eater would not touch what they served, not his thing, however, the restaurant was very accommodating and brought him as much white bread as he would eat along with milk and I had some cheerios in my purse, it worked out perfectly and he enjoyed himself as well. He said he had a delicious time, LOL. Of course we had dessert, I couldn’t get enough of a good picture but it was Pecan Pie made with Steen’s Cane Syrup and leaf lard with a butter crust. Need I say more. We rolled, literally, out of there and passed out in our hotel. After a good night’s sleep our next order of business was breakfast. 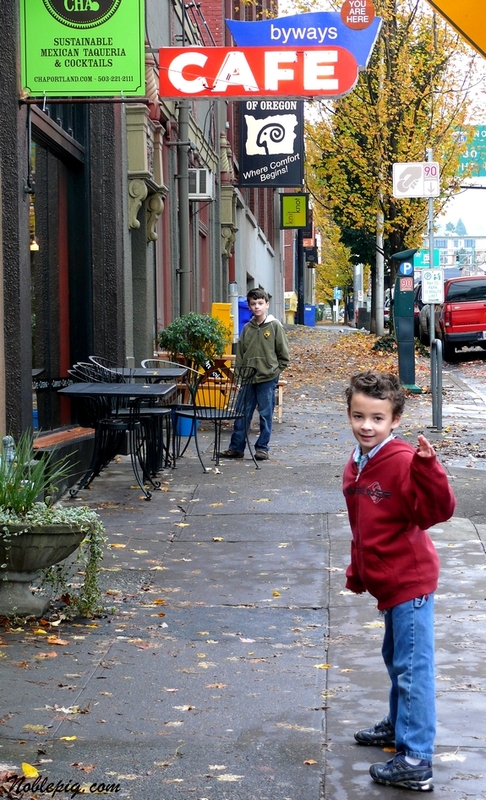 We headed out about a 1/2 mile from our hotel room to the Pearl District of downtown Portland where the Byways Café was located. The cafe is a tiny spot with about 5 small booths, 5 or 6 tables and a counter that seats maybe ten. On a Wednesday morning we waited about a half hour to sit down. I can’t even imagine what it would be like on the weekend, I’m assuming a long wait, and there is no place inside to do this comfortably. But trust me, it was worth ever bit of it. To see the footage of when Diner’s, Drive-ins and Dives visited Byways, go here. Just to see the preparation of their Amaretto French Toast made with thick sliced challah bread, soaked in amaretto, cooked to a custard consistency then smothered with honey, maple, pecan butter and doused with organic maple syrup…OMG. I wanted to order this but it takes at least 15-20 minutes to make and my kids were starving….next time. Instead I ordered, what you see here as a sea of fluffy, blurry white sauce, the BEST homemade biscuits and sausage gravy I have EVER tasted. EVER. 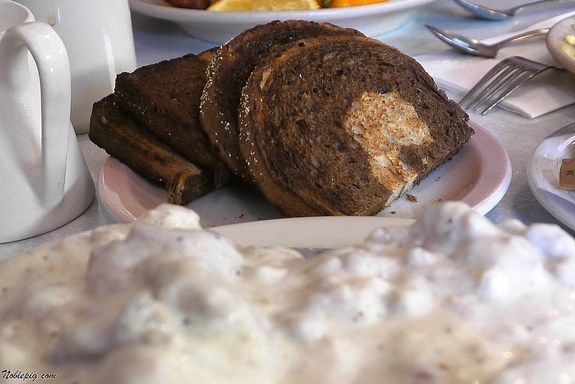 My camera could not even focus on the large 10-inch diner plate filled to the edges with this incredible breakfast, it focused only the marble-rye toast in the foreground, another amazing part of my meal. Honestly I closed my eyes when I took the first bite, it was one of those surreal food moments. I have been thinking about this meal ever since we left. Every meal is large in size. The waitress was very helpful in helping the kids place a proper order as one breakfast would have been too large for one of them. Instead they split what were the most incredible buttermilk pancakes and thick-sliced bacon along with some scrambled eggs. She brought extra plates and lots of warm maple syrup for them as well. I also couldn’t leave there without trying their blue corn pancakes made with organic stone ground blue corn meal. Unreal. We also shared a cheese omelet stuffed to nines with Tillamook and cheddar and the most incredible home fried potatoes you could imagine. As you could expect, we did not eat lunch that day. We didn’t need to. We had enough energy to walk the whole city that day and didn’t have dinner until maybe 6 PM. Our next Diner’s, Drive-In and Dive meal was for breakfast on Thursday at Pine State Biscuits. This was probably the tiniest place we went to, but is famous for all their versions of biscuits and gravy. There were two tables for two, 5 seats at a counter and one table for four. By some act of God, when I walked in the door, the table for four became available, we were very lucky. Every seat was taken, a line formed constantly and there were no signs of this place slowing down. This was the inside. You walk in, place your order and sit down (if you can). I’m not sure where you would go with your food if you couldn’t sit. Most patrons do not linger as they know everyone is waiting to find a table. In other words, you do not read the paper here. Your name is called when your food is ready. Here is their regular order of biscuits and sausage gravy, hit with cayenne for a spicy taste. It was delicious. Yes it was early, as you can tell by the look on my little guys face! He adored their bacon. This was Pine State’s Reggie Deluxe. OMG. There are no words for this. Fried chicken, bacon and cheese topped with sausage gravy and a fried egg. Save me from myself is all I can say. Pine State had the best coffee in Portland. I drank three cups and I could have had another. Incredible, incredible. What a time we had. In the near future we will be visiting the five other Diner’s, Drive-Ins and Dive’s in Portland, we can’t wait. Arleta Library Bakery & Café. I have to go here for their hash. See the episode on Diners, Drive-Ins and Dives right here. Otto’s Sausage Kitchen…need I say more. Bunk Sandwiches. The Pork Belly, Sauerkraut, Gruyere & Russian Dressing Sandwich is mine. Pok Pok. This Thai place was voted restaurant of the year by the Oregonian Newspaper. I do not have the video from Diner’s, Drive-Ins and Dives but here is the video from the Oregonian. If you have been to any of the places, tell me about your experiences and what you ate. To find a Diners, Drive-In and Dive restaurant in your area, visit here to see where the show has been. Food at little old diners is alway just THE BEST… usually serve ‘heart attack on a plate’ meals but they remind me of the food I grew up on. Oh, and how about those turquoise colored chairs! Love em. Will look forward to more diners. OMG..what a delicious tour of food. i am a total sucker for biscuits and gravy. I might be able to live on that chicken sandwich!!!! I think I just died and went to heaven. Thanks for all the video links, those were fun to watch. That French Toast. oh my word. I am going there when we go to Portland next month. Pine State rules. Two other great diners are Fat Albert’s (on SE Milwaukee and Bybee in Eastmoreland) and Bertie Lou’s (on Milwaukee and Tacoma). Both delicious. What a fun way to enjoy eating out. We did about the same thing a couple of years, going to all the places that Bill Geist visited on CBS Sunday Morning. We went to Hell’s Michigan, and another place in Ohio to eat the best bologna sandwich in the USA, and others. We have never been disappointed. Of course, I am not hard to please. I can see fall is definitely in the air in Oregon. Loved the photos. Thanks for this one. Dear God…that food looks amazing. This is what I describe as ‘slutty food’, and I love slutty food, who doesn’t? A delicious heart attack in every bite. Great post. Love your blog too! Wow, what great eating adventures! Love the photo of your youngest hooligan on the street and the two of you together. 🙂 I just saw Guy Fieri on Leno answering the 10 @ 10. I would love to follow Guy’s trail! What a wonderful adventure. The food looks beyond yummy and that first and last picture has me convinced you could be a food photographer. One thing really cracked me up. You keep cheese in your purse? Beyond, beyond jealous. I would love to go to all those places he visits, I sit watching with my jaw dropping the whole time. I enjoyed watching all the videos, thanks! I’ve been wanting to go to Pine State Biscuits for years! Your picture added yet another reason to get my booty over there ASAP. Also, please post when you visit Pok Pok. That’s another place high on my list of places to visit, and it would be great to hear what you think about it! If you’re traveling on hiway 26 between Portland and the coast, don’t forget to go to the Helvatia Tavern for one of the most amazing cheeseburgers on the planet! We were enticed to go to Primanti Bros. while watching Diners, Drive Ins, and Dives, but we weren’t thrilled. Since you had such a great success rate, we’ll try again. Diner food is the best. And often the more disreputable it looks, the better it is! Wow, awesome eats! I especially would love the Pine State’s Reggie Deluxe! Yum!!! Don’t forget to check out Little Red Bike Cafe on Lombard St in the Columbia area…absolutely fabulous! Best fried-egg sandwiches around! That’s my kind of tour…and of course I want to run out to my car and drive to Portland. I love that show, too. My hubby and I love watching Diners, Drive Ins and Dives too! We haven’t gone on a trip in a while, but we plan to look up places to eat from the website when we do. Ok, the biscuits and gravy … gets me every time! I’m drooling on the computer! GLORY…our idea of retirement travel would be to look for waterfalls and eat our way through triple D restaurants. Wow, delicious looking food. Biscuits ( we call them scones) with gravy isn’t food we have in NZ – I must try it. Just to confuse people further – you call another food item cookies? We call them biscuits! I was excited to see your post on Portland eateries, my wife and I travel there a lot, (truck drivers) we had a chance to try Pok Pok last week and I can only warn that if you don’t order the wings you will be cursed, they are the finest morsels of bird ever to pass my lips. Also be advised not to order any of their other chicken dishes along with the wings as, although very good themselves, they will pale in comparison to the wings. Order spicy style, which really aren’t all that hot. What a whirlwind tour of such comforting foods Cathy. One more reason to visit Portland! There are a few places from MN featured on his show, one only 3 blocks from where I grew up and ate there a lot as a kid, but not since I married and moved away. Yum. I should look up the other ones too…. When I saw the title of your post, I said out loud ‘I Hate Her!” (I mean that in a loving way) I immediately knew you had gone to Pine State and turned the lap top top around so the hubby could see. GREAT photos. As you know Pine State was at the IPNC and I nearly had a fit. Have you ever had as good of gravy??? They told me sage and maple syrup are a couple of the secrets. Portland is such a great city. Pok Pok is next on my list. Did you get to Kenny & Zuk’s by any chance? Best pastrami in the world. Wow! Portland is looking better to me all the time! I’d have ordered the same thing your hubby did… the Plato Tejano. Totally Ymmulicious! OMG I am so jealous I’ll be green for days. DAYS! Portland… The Reggie Deluxe – I want NOW! How neat that you actually got to eat in those diners! They all looked wonderful and your family is great to be so adventurous! Green with envy. Have been trying to go to Podnah’s and Byways for a while now and never get there, on the weekends it’s so crowded. I’ve been to Pine State, it’s unreal. I would rather have gone to these places than all the other fancy restaurants. You are so lucky!! I’ve always wanted to got to Biways CafÃ© but whenever we go there is a mile long wait outside. PokPok is one of my dear friends very favorite restaurant – she said you can’t get a bad meal there. Now I am craving biscuits and gravy! I am so jealous! All that food sounds (and looks) amazing! How much fun! I’m going to see if there are any he’s visited in our area. Cathy, you are so pretty…. now I know where your good looking sons come from. 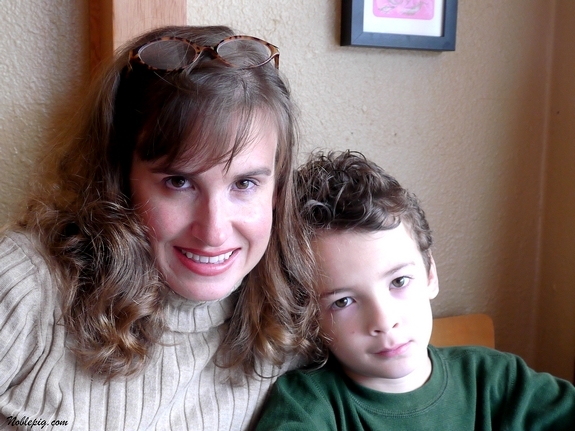 Anyway, you are lucky to have the pleasure of visiting restaurants with your kids. Food look scrumptious. I am so excited to read/see about your DDD trip! My husband and I went to New Mexico last month just to eat at DDD places (and to see a few sites). The food was like nothing I had ever had before. Portland is definitely on our list for a DDD visit along with Arizona and Texas. So far I’ve been to 12 DDD places this year. Isn’t it amazing how exciting it makes your trip to be able to visit the places featured on the show? Thanks so much for this post!! Love DDD, love Guy…and LOVE all that (politically incorrect) food. Now I can’t wait to go to Portland! biscuits and gravy is the balm that eases any pain i might have, and it’s rarely better than at a greasy spoon. i love d3 and i think it’s awesome that you sought out places that guy has visited! OMG I LOVE Triple D! That biscuit is disgustingly good-looking. I’d eat 4 of them. Love those types of places. OMG! 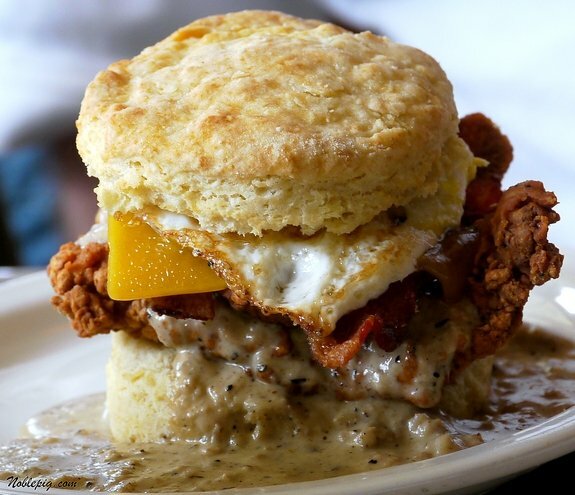 The biscuits and sausage gravy were enough to make me drool, but that fried chicken, bacon, and cheese sandwich makes me want to take a trip to Portland! We love DD & D with Guy. Breakfast is my favorite meal so I love little diners! It’s sad. I haven’t been to any of these places! I love that show and it’s always so exciting when he’s in Portland. The basic biscuits and gravy look out of this world good! I love all your pictures. I wash Guy every Monday and love his show. One of my favorites. My husband and I recently went into Washington DC to a chili dive that he visited and it was fantastic! Your sons are so cute, too. My husband and I watch that show all the time too! Whata fun trip–the food looks amazing!! Oy vey!!! I think I just put on 10 lbs reading your entry! 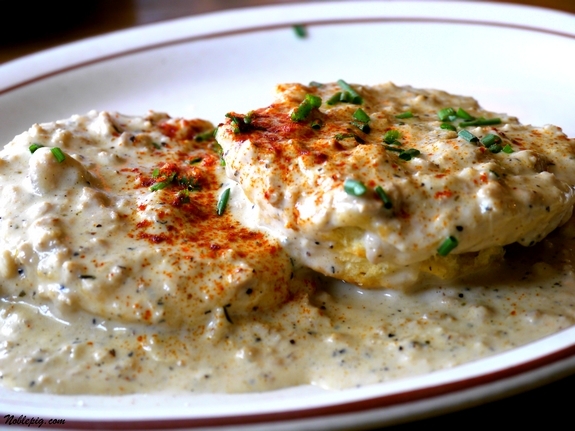 I now want biscuits and gravy after reading this very drool worthy post! I have the ingredients, so maybe for dinner tonight. What great food! Ohhhh, Pine State would have been right on the top of my list. You gotta love biscuits!! Awesome. There are a couple of places in the vicinity of my office that have been featured on DD&D. One is a Venezuelan place and one is a hot dog place. I tried the Venezuelan place before it got famous and I’m glad I did because it’s really hard to get in there now. I love a good greasy spoon where there is always good gravy and calories are never counted! OMG…all of that food looks amazing! That last biscuit (and your first picture) is to die for! I think I need to make a trip just for that! Wow…thanks for sharing, and making my stomach growl! What a great review! And triple D is one of my favorite shows too! We did our own little Drive Ins Diners and Dives on our trip back from Seattle this summer…but we added places from Jan and Michael Sterns “Road Food” into it also. Pine State Biscuits was on our list but alas, we never made it (I think Voodoo Donuts won out). I am a sucker for GOOD biscuits and gravy. Everyone loves mine, but it’s always better when someone else makes it. I guess it’s because I didn’t have to. What a time you are having. Thanks for sharing it with us. Looking forward to the other five. Everything on this post seems worthy of my three-hour drive from Seattle to pig out — noble pig style no doubt. Podna’s is a good choice. I like Russell St BBQ as well. I like Pok Pok but would not consider it a favorite. Bunk Sandwhiches – Creative menu but the quality seems inconsistent. My husband and I just got done eating at Arletas Library and Cafe. He had their Biscuits and gravy which was made with pork loin and the biscuits were made from sweet potatoes. It was very good and I wish I had ordered it. I ordered their Florentine Omelet and was sadly disappointed. The eggs were dry, to much spinach and no cheese to speak of. It came with 3 chunks of potato (their hasbrowns) I had to use my knife to cut through them. The saving grace was my scone serve with fresh strawberries and lemon juice! We left with full tummys.As fo Pine State Biscuits LOVE THEM! Podnahs bbq we too got there and it was empty then filled up very quickly! Ther black eyed salad was to die for as was their corn bread! Hubby had their ribs and me their bbq chicken! We will continue to go here! If ever in down town portland go to Kenny and Zukes Sandwich! You will think you died and went to heaven! Come with a big hole in your tummy cause it will be filled with their yummy and huge sandwiches! I just stumbled onto your blog in a quest to find that BBQ pit restaurant, so first and foremost thanks for helping me find that! I can’t wait to eat there! Also, I work in a tattoo shop right next to Bunk Sandwichs and it is absolutely delicious. Their roast beef sandwich is my absolute favorite, which is saying something because after a bad experience with a roast beef sandwich, it’s definitely not my go-to sandwich. Another wonderful ‘dive’ I love is the Hot Cake House on Powell! Check it out! That’s so yummy. Your blog is so awesome I cant resist myself to give you a comment. I am so excited to make such dishes. Great post! We visit Portland once a month and now have been to Bunk Sandwiches (Pork belly Cubano is a must), Byways Cafe, and Fat Albert’s. All were brilliant. You inspired me to visit the rest…this weekend its Podnah’s and Pine St! 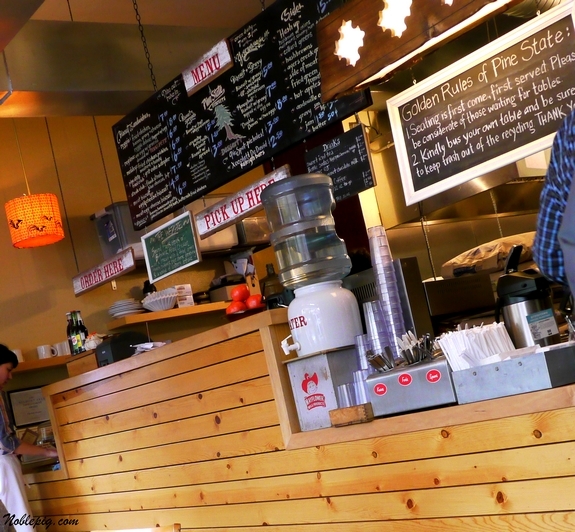 Thanks for your review of a few of Portland’s standouts. 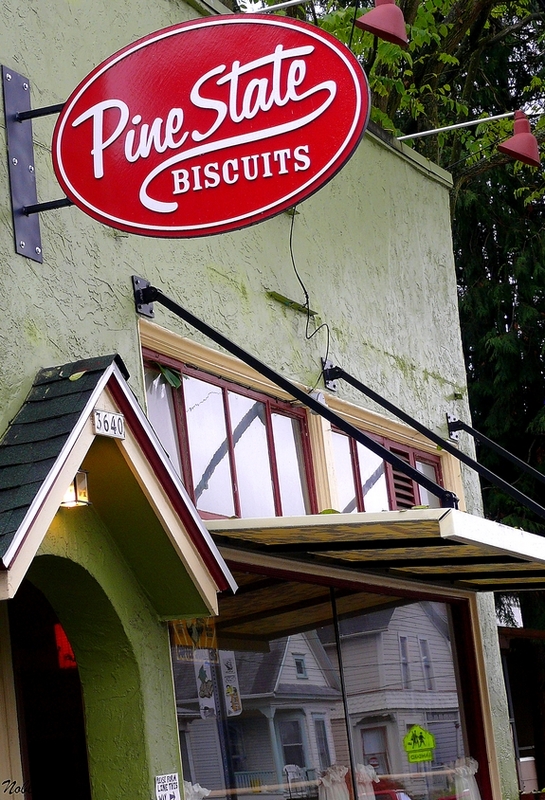 I want to get behind the counter at Pine State Biscuits to learn how to make their heavenly biscuits. If you remember, they grate cold butter to you don’t have to over mix the dough. Something I have yet to try. If you’re ever in the Salt Lake City area, I would highly recommend the Blue Plate Diner nestled in a residential/commercial neighborhood called Sugar House. 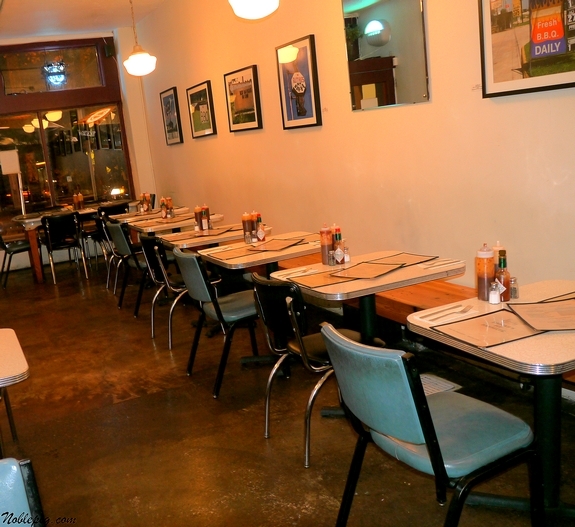 There’s plenty of seating, but it’s busy on the weekends, so it might be a few minutes to wait for a table. I had the smoked salmon eggs benedict – Wow!!! They smoke their own salmon on the premises. My husband were in SLC for two days, and we ate at the Blue Plate twice. Didn’t try their biscuits & gravy, but the serving was huge! And orders come with homemade home fried potatoes. 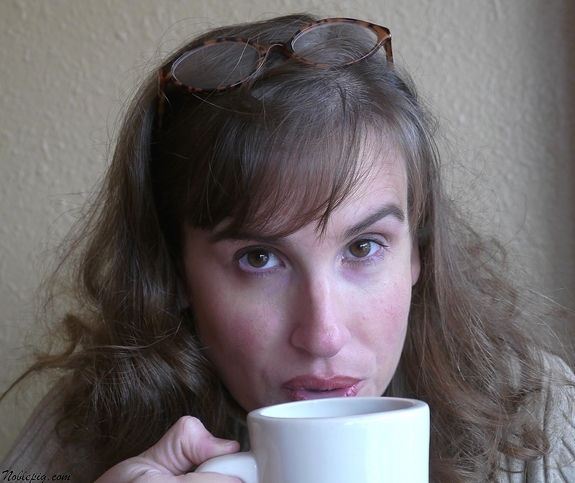 Coffee was excellent.